The Sharp Scissors Lady: Crayola's Coming Out of Your Ears? Crayola's Coming Out of Your Ears? Here's a quick peek into the table decor of my son's first birthday party, December 2008. 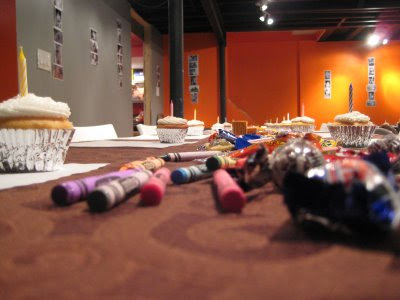 I started planning the party well in advance, including picking up plenty of $.25 boxes of Crayola's the summer before. I LOVE coating party tables with the inexpensive paper place mats that you'd find in an old time restaurant- I pick up packs of 100 at Gordon Food Service for a couple of dollars ($3-$4), and not do they look cute, define seating, but they help entertain party guests too! Kids of ALL ages love to color at the dinner table...wink! I've also included Crayola's and coloring books as gift toppers for Christmas and Birthday's, but I'm super curious as to what YOU have creatively repurposed extra school supplies for!!! I bought 40 boxes of crayons last week when they were money makers at Kroger. I am going to put some of them in the gift bags at my daughter's birthday party. And I think I am going to borrow your paper place mat idea. The rest of them will be used to refill the crayon bins in the Sunday school rooms at church. I love your paper place mat idea...wish I had thought of that a few years ago. It would have come in handy many times! I love your ideas and so do my friends and although we dont always leave comments, please keep sharing. I only hope you have a great archive section because I dont like to print and save stuff. helping individuals with a bad credit score. upfront fee or any application fee, processing fee or any monthly fee.